Portable pH Meter is suited for students. Model CD80 battery powered pH Meter offers large, uncluttered digital display and pushbutton controls. Protective rubber boot shields it from accidental knocks and built-in stand is provided for bench-top operation. Suited for environmental and educational applications, meter is supplied with pH electrode, temperature probe, and buffer solutions. WPA Ltd introduces the NEW CD80 Battery Powered pH Meter; ideally suited for environmental and educational applications. The CD80 is a value for money instrument that has been designed for use anywhere that cost is a consideration. With a large, uncluttered, digital display and simple push button controls, this instrument is ideal for students at all levels of education. The unit is compact and robust enough to withstand the rigors of the field use and the teaching environment. A Protective Rubber Boot shields the meter from accidental knocks and a sturdy built-in stand is provided for easy bench-top operation. Water Tester simplifies chlorine demand measurement. Digital pH Meter offers automatic temperature compensation. Pocket pH Meters utilize non-glass silicon chip sensor. 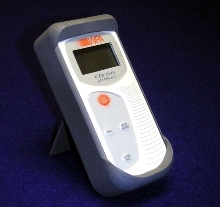 Digital Handheld Meters/Testers measure EC, TDS, temp, and pH. Digital pH Meter covers 0-14 pH range.